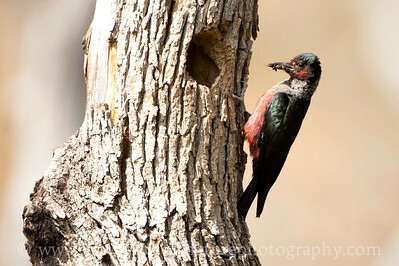 Lewis's Woodpecker at its nest hole. 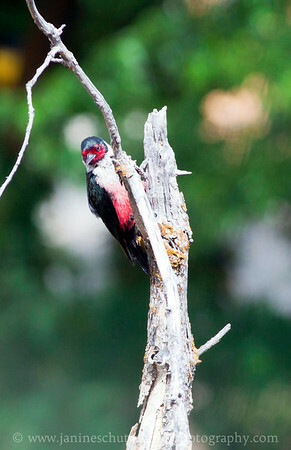 Photo taken at the Oak Creek Wildlife Area near Naches, Washington. 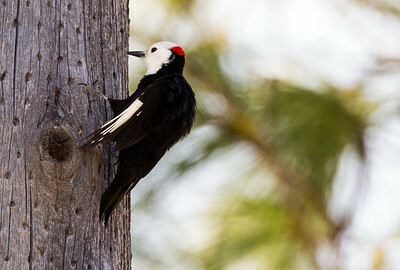 Male White-headed Woodpecker. Photo taken along the nature trail at the Leavenworth National Fish Hatchery near Leavenworth, Washington. 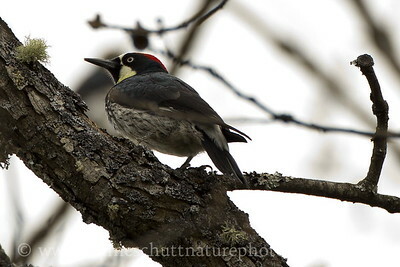 Female White-headed Woodpecker eating mullein seeds. Photo taken at Little Pend Oreille National Wildlife Refuge near Colville, Washington. 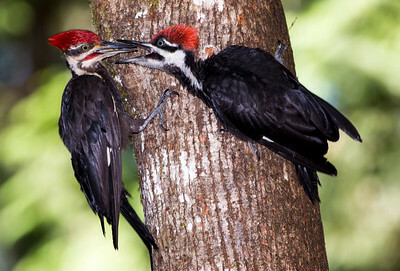 Male Pileated Woodpecker feeding a juvenile male. Photo taken near Bremerton, Washington. 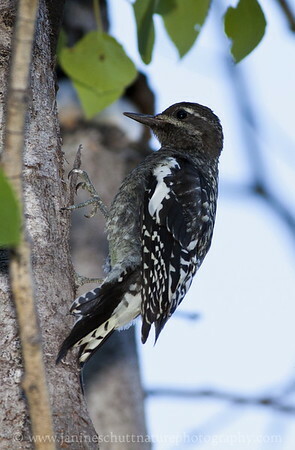 Juvenile Hairy Woodpecker. Photo taken near Bremerton, Washington. 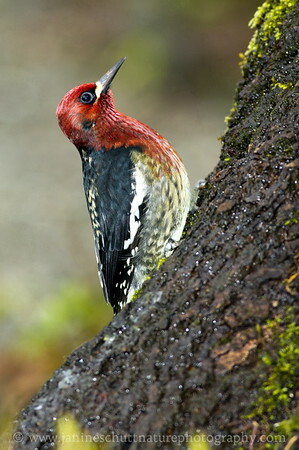 Red-breasted Sapsucker near Bremerton, Washington. 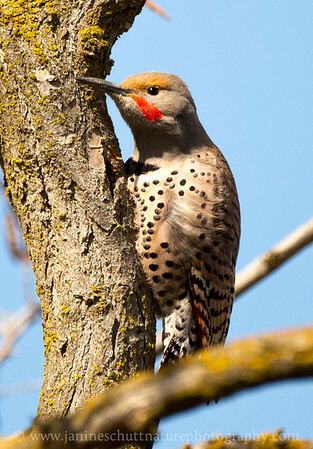 Male "red-shafted" Northern Flicker near Mattawa, Washington. 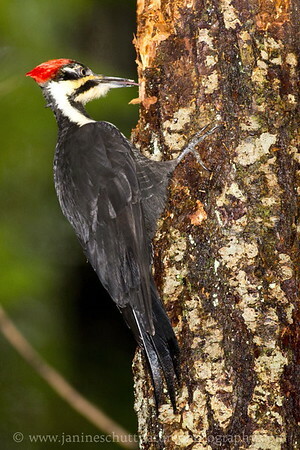 Male juvenile Pileated Woodpecker on a western hemlock trunk. Photo taken near Bremerton, Washington. 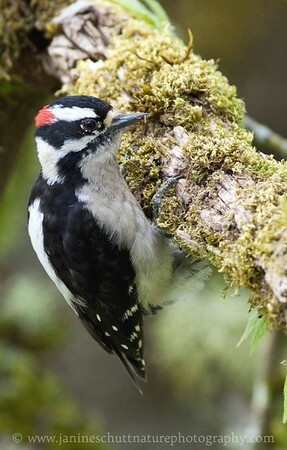 Male Downy Woodpecker at Nisqually National Wildlife Refuge near Olympia, Washington. 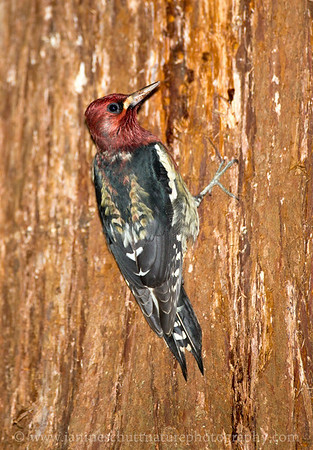 Red-breasted Sapsucker at Scenic Beach State Park near Seabeck, Washington. 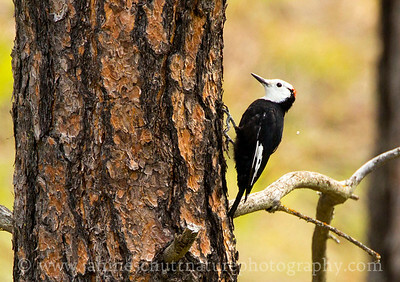 Possibly a leucistic Lewis's Woodpecker. Photo taken at the Oak Creek Wildlife Area near Yakima Washington. 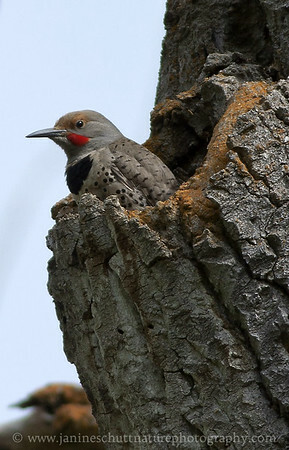 Male "red-shafted" Northern Flicker in nest hole. 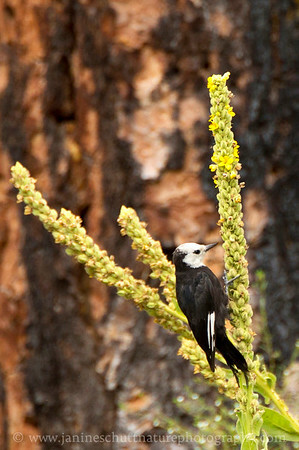 Photo taken at the LT Murray Wildlife Area: Robinson Canyon, near Ellensburg, WA. 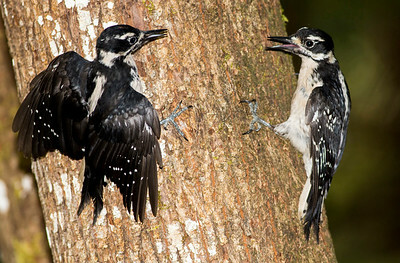 Rival Hairy Woodpeckers battle for position on a big leaf maple tree. Photo taken near Bremerton, Washington. 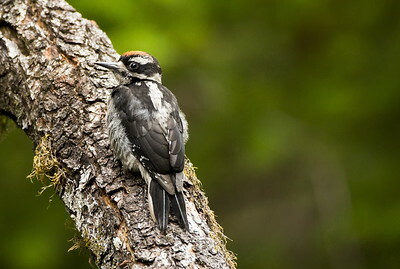 Male Downy Woodpecker tending his nest in an alder tree. Photo taken at the Coldwater Lake Recreation Area of the Mt. St. Helens National Volcanic Monument in Washington. 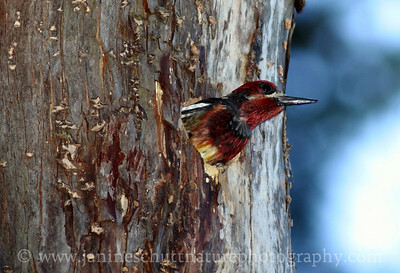 Red-breasted Sapsucker in nest hole at Scenic Beach State Park in Seabeck, Washington. 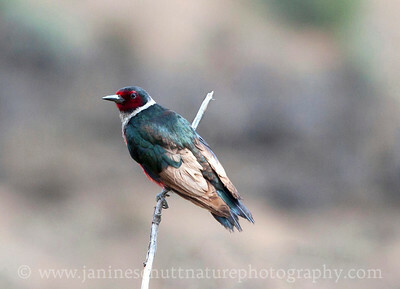 Lewis's Woodpecker. Photo taken at the Oak Creek Wildlife Area near Yakima Washington. 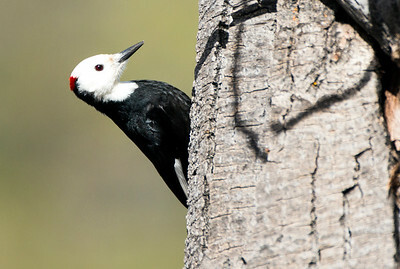 Male White-headed Woodpecker foraging on a ponderosa pine. Photo taken at Little Pend Oreille National Wildlife Refuge near Colville, Washington. 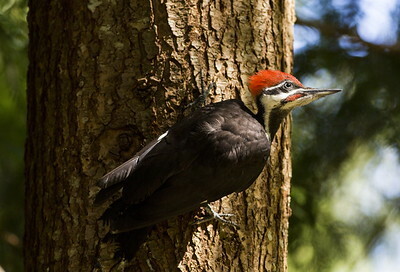 Male Pileated Woodpecker at Kitsap Lake Park near Bremerton, Washington. 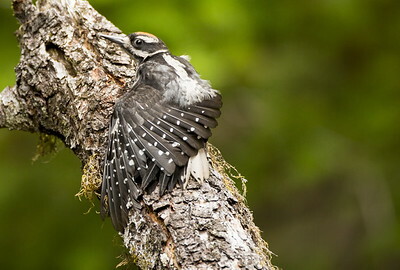 Immature Hairy Woodpecker stretching its wings. Photo taken at the Staircase, Olympic National Park near Hoodsport, Washington. 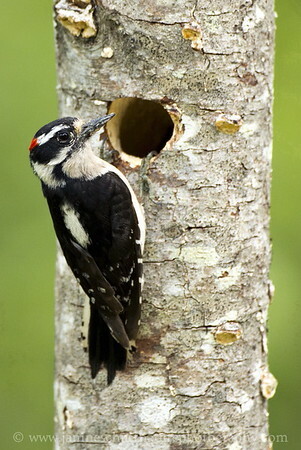 Female Williamson's Sapsucker. Photo taken at the Bonaparte Lake Recreation Area near Republic, Washington. 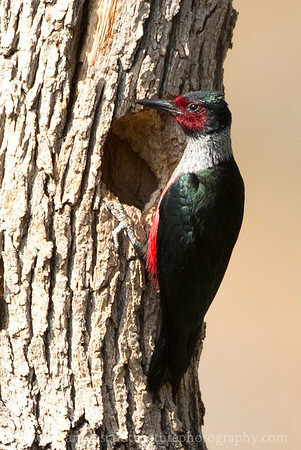 Red-breasted x Red-naped Sapsucker Hybrid. 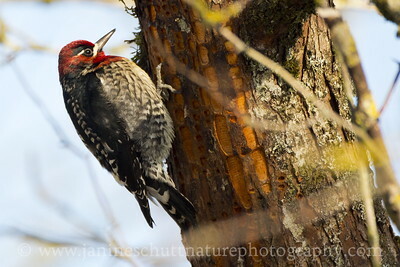 Photo taken at Steigerwald Lake National Wildlife Refuge in Washougal, Washington. 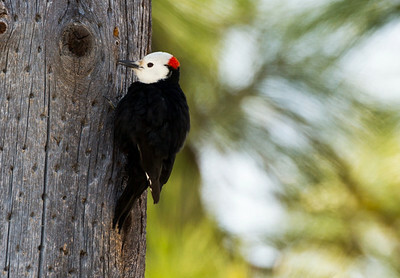 Acorn Woodpecker photographed along Balch Rd. near Lyle, Washington. 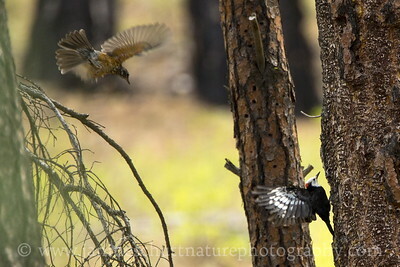 Male White-headed Woodpecker lands on a ponderosa pine snag while a young robin flies by. Photo taken at Little Pend Oreille National Wildlife Refuge near Colville, Washington. 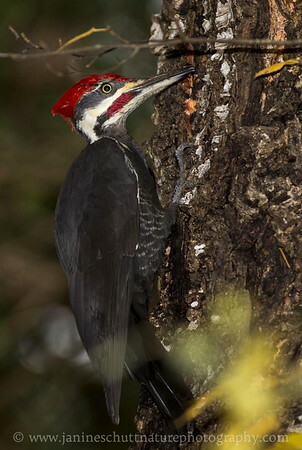 Female Pileated Woodpecker at Scenic Beach State Park near Seabeck, Washington. 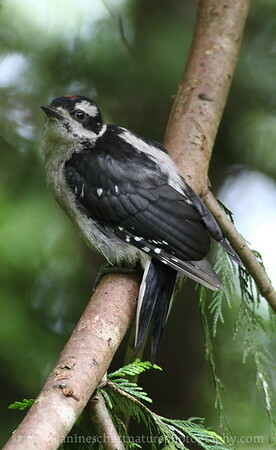 Immature Hairy Woodpecker at the Staircase, Olympic National Park near Hoodsport, Washington. 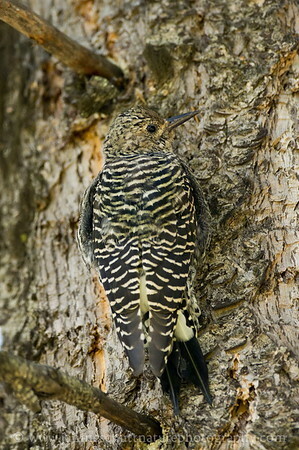 Juvenile Red-naped Sapsucker. Photo taken near Winthrop, Washington.